Now here's my challenge to you all. Do you find yourself in the same predicament? 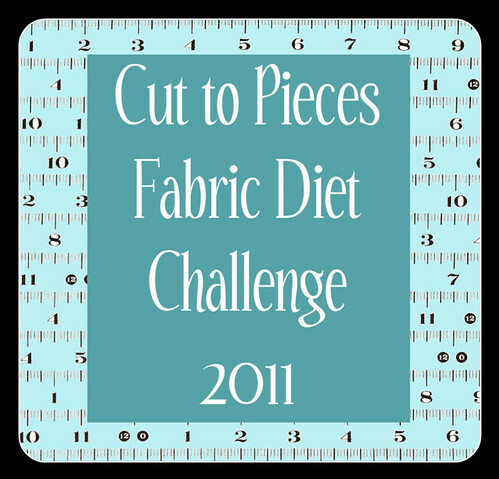 More fabric than you know what to with and not enough finished projects? Well come join me and we'll help keep each other accountable. I think we can check in each week and console each other over the fabric that we wanted to buy but didn't... or even admit that we did buy something (we're all friends, it's okay if you cheat LOL). And just because I like to have a good time even while denying myself something, I think we should make a bit of a contest out of this.
" I'm in the same boat, and stopped buying fabric on 11/30/2010. I've decided the only fabric I'll buy for one year will be what is necessary to finish a project. I'm sure I have enough for 12 months of quilting and projects. If I run out, then I'll start buying. I have no UFOs, I'm religious about finishing what I start." I think Angela has a great idea, feel free to join up, she's starting the challenge on January 1st, and it last for 8 weeks. Great idea. My goal for this year is to actually clean out my sewing area and find all the projects I have. And then actually finish them. I know of at least 4 quilt kits Mark bought me about two years ago that I just remembered I had. And I will learn how to use my long arm quilter this year if it kills me. So hold me to it!